While the North Georgia Relic Hunters Association does not recommend any particular Web Site, when a member has a site which they feel other club members may like to visit, we will post them in our Links Section. If you have any web sites that you think other club members would be interested in (for example: to research information about the Civil War, find out about upcoming shows, check our relic shops, or find out what other clubs are doing) please let us know. Here are some sites our club members have recommended. Metal Detecting Hobby website - Choose the state you want to get to know the laws and regulations for relic hunting. Each state and municipality differ. BulletAndShell.com – The place for artillery and bullets. You can find a lot for sale but there is also a discussion forum on Bullet And Shell where the top minds on Civil War artillery and shoulder arms projectiles meet and share knowledge. Everyone is welcome to join. Greybird Antiquities – Butch Holcombe’s relic site. This local author and relic hunter offers unique items for sale. Shiloh’s Civil War Relics – Rafael Eledge's web site for all kinds of relics. Civil War Dealers – Many well known established Civil War Dealers under one website. American Digger Magazine - Site for tons of information for people who dig relics and want to know more about relics and digging. Civil War Artillery Projectiles – Site designed to help the reader to better understand the variety of ordnance used by the Confederate and Federal forces during the American Civil War. The authors (Jack W. Melton, Jr. and Lawrence E. Pawl) have made every effort to be accurate, and whenever possible, archival and patent records have been used to support the information contained herein. North South Trader – Steve Sylvia’s site of the North South Trader Civil War Magazine, the bimonthly magazine for Civil War Collectors, relic hunters and historians. 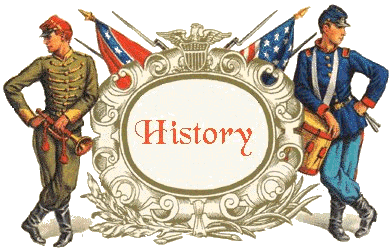 Civil War Clip Art Gallery – Check out this site if you are looking for some Civil War clipart. North Virginia Relic Hunters Association – Interesting website on a relic hunting club located near Centreville and Chantilly, Virginia. Civil War Courier – Site of the Civil War Courier, a current events newspaper produced monthly. Civil War News - Site of the Civil War News, a current events newspaper produced by a national staff of reporters and photographers. It is published every month but March. National Park Service – The National Park Service Home page. Kennesaw Mountain Battlefield – Home Page for the Kennesaw Mountain Battlefield in Georgia.